Safco E-Z Stor Literature Organizer - 3" Height x 9" Width x 12.25"
Sturdy, compact and convenient organizer stores, sorts and organizes letter-size literature using a minimum of floor space. 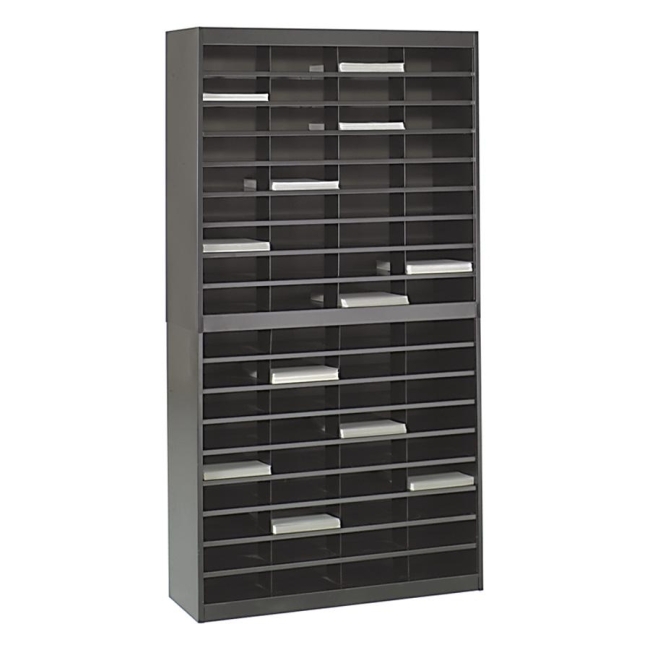 Premium steel unit is built with a strong steel frame and reinforced bottom shelf. Steel shelves and dividers interlock for extra strength. Double sidewall construction with solid fiberboard back. Compartments hold up to 750 sheets in letter units. The letter-size compartments measure 9" x 12-1/4" x 3". Identify the contents on the wide shelf fronts that serve as label holders. Quick connect uni-lock assembly. Organizer is made with 50 percent recycled material.